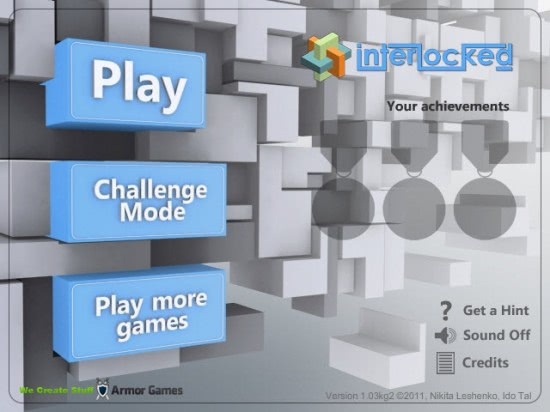 Do not you hate it when flash games make use of low resolutions so that it becomes difficulty to play the game? When other elements on the page the game is embedded on distract from the gaming experience? Or have you found a solution to increase the size of the flash content only to find out that it cannot be used to scale all games, or that it had a big impact on the performance of the Flash game and caused lags? Update: The extension is no longer compatible with recent versions of the Chrome web browser. It requires access to the Flash NPAPI plugin, but that plugin is no longer supported by Google Chrome. We suggest you use an extension like Full Screen Flash instead which is still fully compatible with recent versions of the web browser. SwiffOut for the Google Chrome browser is an incredible extension, and I'm saying that after testing many different solutions to run flash games in full screen. What makes it that incredible? For one, it introduces lag free fullscreen gaming to the Chrome browser. Fullscreen in this regard means that all browser UI elements, like the address bar or title bar, that are normally still displayed are not shown. Only the flash game is shown in full screen on the computer monitor. That alone makes it superior to comparable solutions. 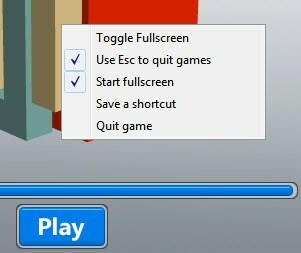 SwiffOut determines the best possible resolution to run the game to improve performance in fullscreen mode. Even better, the Chrome extension works even if flash games do not support scaling. So how does it work? Chrome users need to install the extension first. It places an icon in the Chrome address bar that switches to full screen mode when Flash contents are embedded on the active page. If no contents are discovered nothing happens. If a Flash element is discovered it will switch automatically to fullscreen mode. Only the flash content is then displayed on the screen, everything else is hidden and not shown anymore. Take a look at the before and after screenshots of a Kongregate game. This is a screenshot of the standard browser UI. All browser controls and elements on the page are visible. This is a screenshot of the full computer desktop (note not the browser window!) after the Swiffout button has been activated. Only the flash game is visible on the screen. 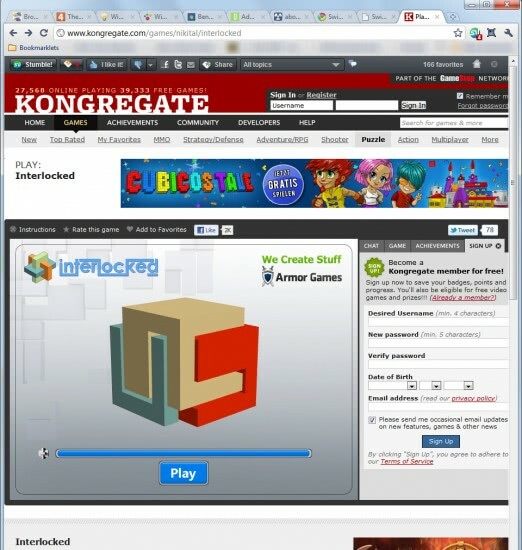 I have tested the Chrome extension on several popular Flash gaming websites, including Armorgames, Kongregate and Addictinggames. Most games could be played without difficulties, a few were blurry which was probably caused by the selected resolution. The games were still playable though. The ESC key on the keyboard exits the fullscreen mode. The extension displays an intermediary page at this point with a back button to open the game page at the developer or gaming site again. Another interesting feature of SwiffOut is the ability to create game shortcuts. These shortcuts are placed on the computer desktop. A right-click opens the context menu with the option to save the shortcut to the desktop. This opens the save file dialog window. The shortcuts are placed as .lnk files on the computer which indicates that this will only work on Windows. A double-click on a lnk file starts the flash game immediately in full screen mode which is very comfortable and unique as far as I know. As a side note, I have tested the extension on popular video portals as well but it did not work with Flash video at all, at least not on portals like Youtube or Gametrailers. Google Chrome users can install the latest version of the SwiffOut extension directly on the Google Chrome extensions gallery. A review of a browser extension for the Google Chrome web browser which lets you play any Flash content in fullscreen. Mightee, it works incredible well. I’m rarely impressed by extensions but this one is excellent. I wanted to thank you for spreading your love for SwiffOut. What’s even better is that ghacks is actually in my feed reader. It’s just a pleasure to see your own work on a such well know blog… and a very good surprise. I wanted to add that SwiffOut also works for IE and Firefox. It is not limited to Chrome. The other browsers version are available from http://swiffout.com. Hej Emmanuel, thanks for commenting. You have created a great extension. Is it working the same way in those browsers? Yes, they’re just the same : one button that run the game in full screen. They are completly similar. The player itself is the same executable for all extensions. The part that is different is the one that detect the swf and run the game. I had to make one for each browser, but the common player simplified the developement a bit. that’s great, gonna have to try it out soon! I hope this also fixes those annoying Flash ads on sites like ninjakiwi that aren’t just annoying because they’re ads, they’re also slowing down the game. hmm… need to dig around a bit more to troubleshoot. Is it Initialization or Initialisation? Try to install http://fpdownload.adobe.com/get/flashplayer/current/install_flash_player_ax.exe from the adobe website. SwiffOut use the IE version of flash which may not be installed if your main browser is Chrome. I clean up the error of the Firefox version, but didn’t republish the Chrome one. It kind of ran but doesn’t seem to like Firefox 4 beta 12 or that adobe flash is 32 bit and running on a Windows 7 64 bit laptop. I try it again in a few months. This is one of the best browser plugin I’ve ever used to play flash games. Embedded Objects is the second but it doesn’t work in Firefox 4. Also this plugin doesn’t seem to like Firefox 4. I just want to report that SwiffOut doesn’t seem to work on Kongregate any more. Using Chrome 29.0.1547.66m on Windows 7, with SwiffOut 1.6.0.12 from the Chrome Web Store, trying to play Arcuz (Full Version) on Kongregate, it says: “The application will close. Reason: Invalid SWF file or game: The detection of the size has failed. SwiffOutWnd.cpp line 426”. Doesent work at all for me, when i click download for Chrome nothing happens, if i get it from somewhere else and go to test it, i click the button and nothing happens.